select your photo from gallery, adjust your face and save. Done! 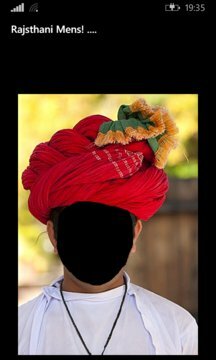 Men or Women anyone can try this app and see how you look in Rajasthani Dress. Save your photos in Rajasthani Dress. Enjoy wearing Rajasthani Dress for fun. This application has many Rajasthani Dress images for you to try, every time you start the application Rajasthani Dress are shuffled, even some hidden Rajasthani Dress are displayed, more you use the app more Rajasthani Dress you will find. Once you select your photo, App remembers it for next Rajasthani Dress. This app received immense response from all the Cross Sections of Community. This app also doubles up as face changer, face swap, dress up app Keep updating for more Rajasthani Dress and fun! Vivid reds, pinks and greens splash across the desert breaking the monotony of the yellow sands; colored stones and tinsels splash their brilliant hues challenging the flaming sun; silver and brass jewellery tinkle and clink complementing the ancient folk songs drifting across Thar the with the arid scalding winds- welcome to vibrant Rajasthan . The costumes and dresses of the native Rajasthanis are a spectacular combination of cultural lineage and weather proof designing. The women dress in either sarees or ghaghra cholis. Sarees may be either cotton or silk and are generally embroidered. Colored stones, tinsels and silken threads are used to create beautiful floral patterns and traditional motifs and enhance the rich look of the saree. Depending on the economic ampleness of the family the embroidery or zari work may be done with golden and silver threads and semi precious gems may replace the showy colored stones. Tie and Dye, Bandhani and block printed textiles are the common choice. The headgears of men are special and spectacular. Pencha, Sela, Saafa, Potia and Pagri are all an assortment of headgear sported by the men of the state. The Pagri is the most famous among these. It is usually 82 feet long and an 8 inch wide piece of cloth. Rajasthan is a northern Indian state bordering Pakistan. Its palaces and forts are reminders of the many kingdoms that historically vied for the region.